2017 Student Achievement Award Winners, left to right: Thomas Nafash, Chelsea Fox, Brogan Dineen, Jennie Prial, Molly Little and Jason Nafash. Pictured with the students are high school leadership academy teacher Mr. Burns and high school principal Dr. Larry Washington. The New York State Comptroller’s Achievement Award is presented each year to a student who has excelled academically and has also shown leadership potential by volunteering his or her time to serve the school or community. 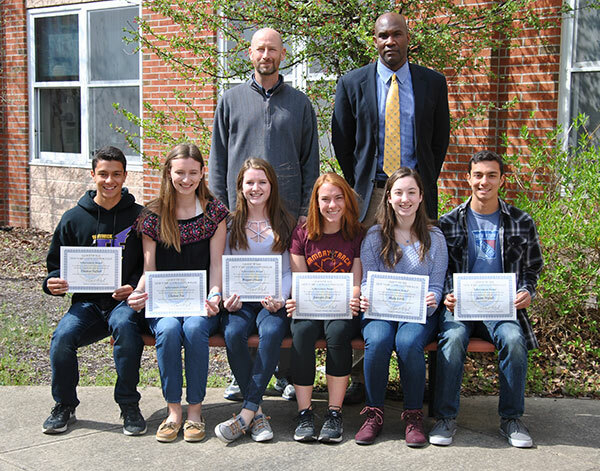 Congratulations to these six outstanding students!